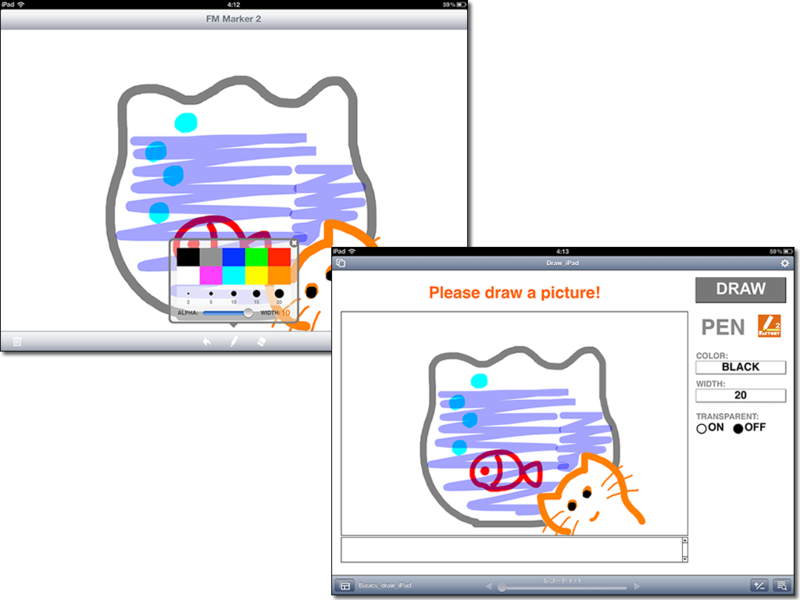 FM Marker 2 is an application using an image stored by the container Field of FileMaker Go 12~17 as the groundwork and you can mark with your handwritten signature or freehand. FM Marker 2 starts automatically from your existing databases of FileMaker Go 12~17 by tapping a button. You can mark and run a script of FileMarker Go by freehand on FM Marker 2. 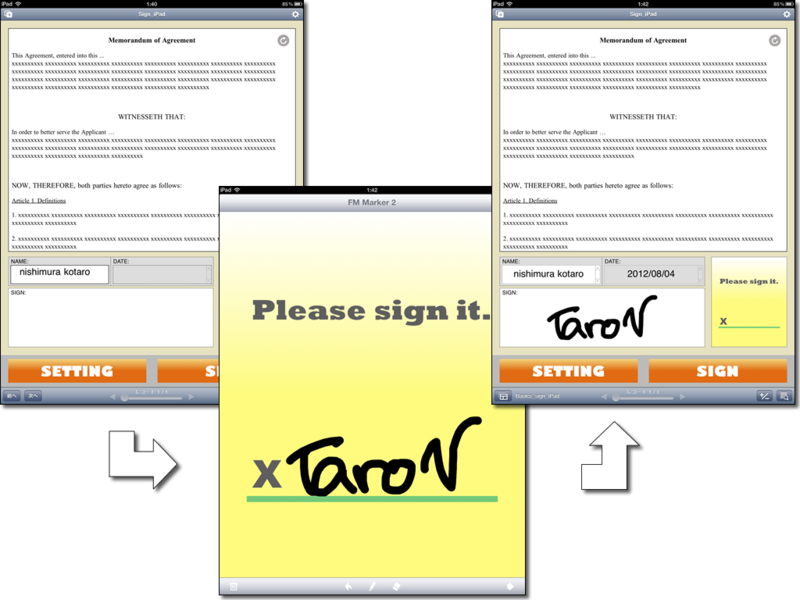 You can use it for various tasks such as for systems that require a handwritten confirmation signature or marking applicable points for an image. Present is only a Japanese video. We're preparing a video with English subtitles. The screenshot is a sample file using FileMaker Go 12~17 and FM Marker 2. From a layout and the system which you made in FileMaker Pro 12~17, you can use FM Marker 2. An image stored by the container field of FileMaker Go 12~17 as the groundwork and you can mark with your handwritten signature or freehand. Set marker size and a color from FileMaker Go 12~17. Set the transparency of the marker. 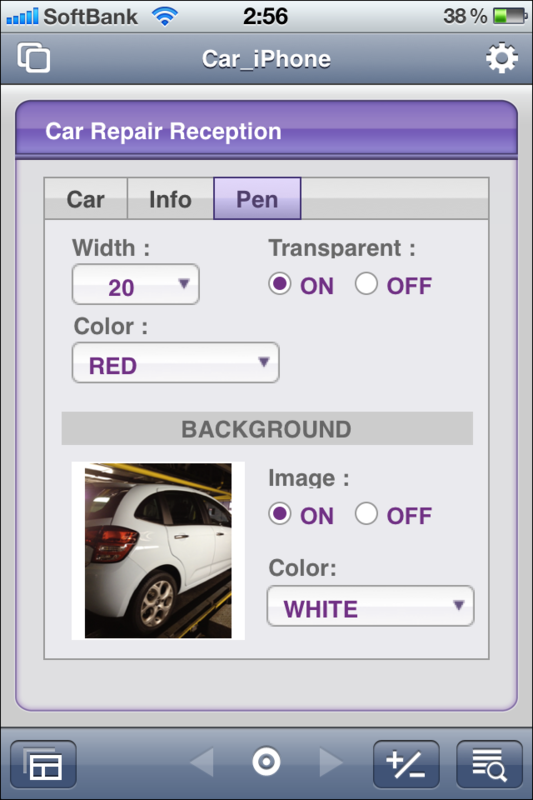 Import a whole screen or just a drawing part to the container field of FileMaker. Open a shared, remote FileMaker Pro file. Specify the account and password in a shared, remote FileMaker Pro file. Passing parameters to the script. A palette was added. It's possible to choose the color of the pen, the thickness and the transparency directly. DONE button and ERASE button will be indication only of an icon. The parameter which specifies the name of 'donebutton' and 'erasebutton' is deleted. 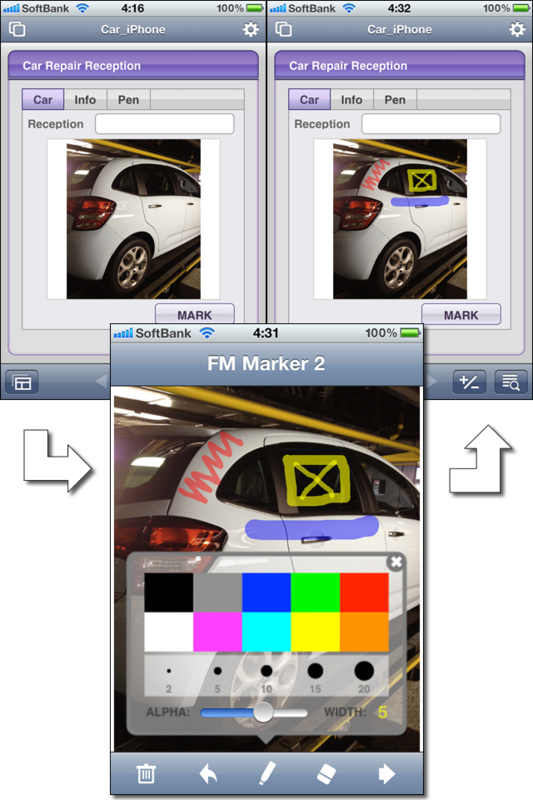 FM Marker 2 is an application to work together with FileMaker© Go 12~17. FM Marker 2 can not be used alone. You can launch FM Marker 2 from a database file of FileMaker Go 12~16 using the factory+fmmarker2:// URL Scheme. After having marked it on FM Marker 2, By tapping launch button in the screen lower right, it is stored a clipboard, and the data which you marked in FM Marker 2 are carried to FileMaker Go 12~17. 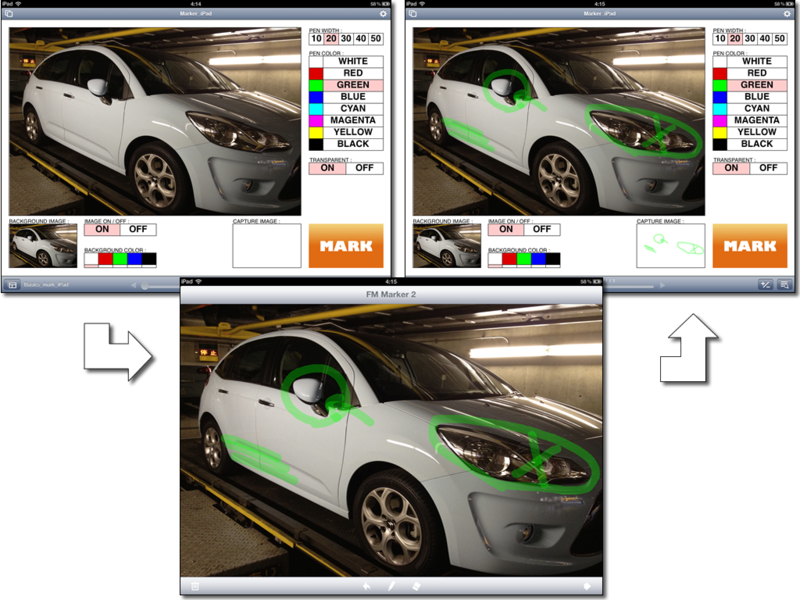 Use the 'capture' action to launch FM Marker 2 and capture a mark data. The parameter names and possible values are defined below. The size of 'whole' is different from iPad by iPhone. 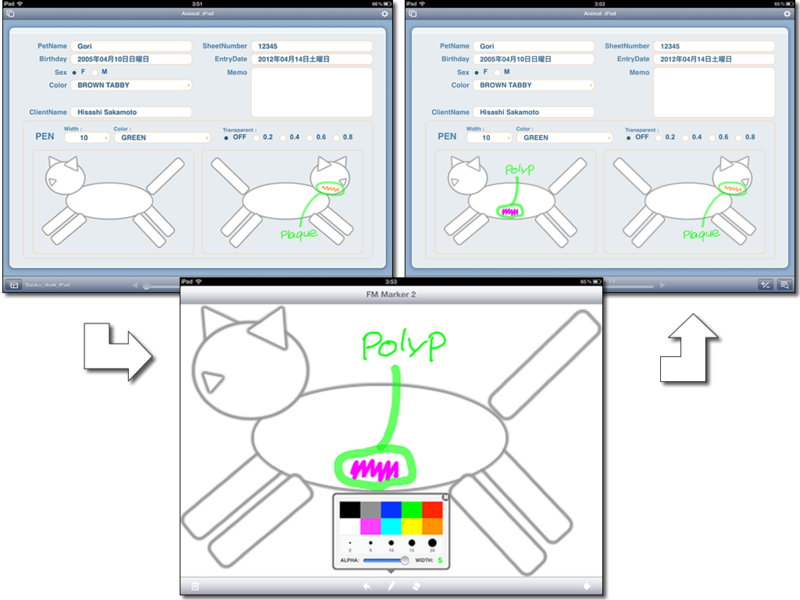 In FM Marker 2, Placement of background image and appoint 20 points of red pens and appoint the MarkPaste script of the Marker.fmp12 database in FileMaker Go 12~17 after marking. The return value is the whole writable area.